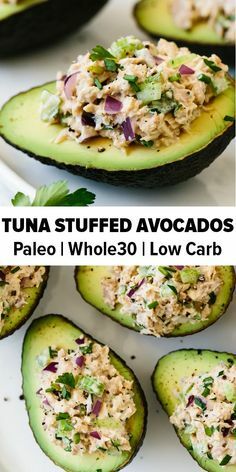 Tuna stuffed avocados are a simple combination of tuna salad and avocados. They're easy to make, loaded with healthy protein, healthy fats and utterly delicious. Watch the video above to see how easy they are to make! Add the tuna, mayonnaise, diced celery, diced red onion, herbs, Dijon mustard, salt and pepper to a mixing bowl. Stir together until well combined. Slice the avocados in half and remove the seed. Dollop a few spoonfuls of tuna salad onto each avocado half.